Open Day - Saturday 27th April New! Come along and join in the fun at BLTC and meet the coaching team. For more information, please contact Gorodn Wilson on 07841-392699 or gwtourtennis@gmail.com. With spring coming, you should think about renewing your membership for the new season which officially commences on 1st April 2019. This year's membership form is available to download from the Membership page. There are also the Secretary's opening letters, the 200 Club application form, and you can view the Club Constitution and Byelaws. Mixed Doubles Social Tennis & Barbecue - Saturday 11th May New! From 1pm on Saturday 11th May, we'll be having a mixed doubles social tennis tournament, followed by a barbecue. There is a sign-up sheet in the clubhouse so that we can cater for everyone, and a £5 entry fee (includes burger/hotdog and drink). Check out the poster here for more details. April-to-June Tennis, Mini Tennis Coaching - plus Easter Camps New! 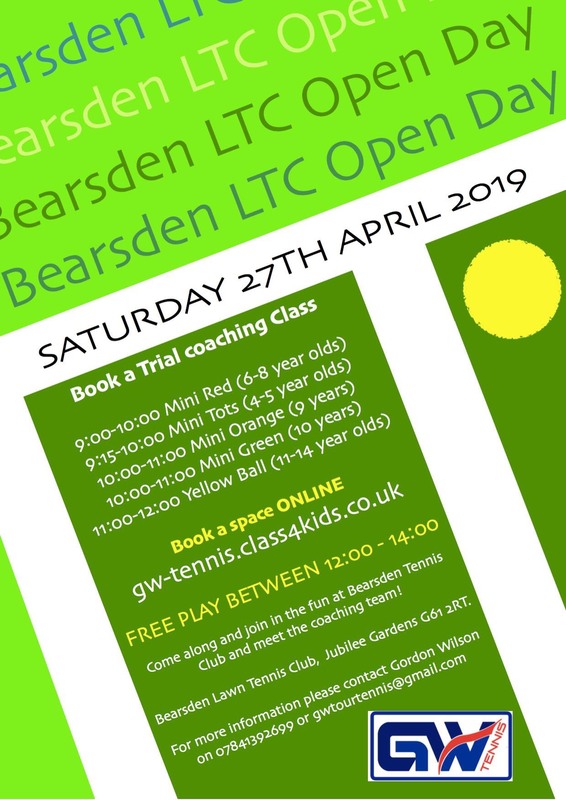 Bearsden LTC Head Coach Gordon Wilson is running a busy coaching programme over the coming months. There are details on the Coaching page, and you can download a Coaching Newsletter, and the Tour Group Booking Form here too. There are also After School Clubs, Coffee Mornings, the ever-popular Saturday Morning development coaching sessions, and Easter Tennis Camps too. ONLINE BOOKING is now available at https://gw-tennis.class4kids.co.uk. Quorn Family Cup (Red Ball) Tournament - Sunday 28th April New! On Sunday 28th April from 2pm until 4pm, we're having a Quorn Family Red Ball Cup event. This is an informal, fun doubles competition where juniors (10 and under - born 1 September 2008 or later) play with an adult family member (parent, grandparent, sibling, aunt, uncle, carer, etc.). At least one member of the partnership must be a member of BLTC. It is a Red Ball competition played on a mini-red-sized court, and the format will be a round-robin with lots of matches. The winners will be invited to a Red Ball Festival Day linked to an LTA-staged Grass Court event e.g. the Nottingham or Manchester Open. Last year's winners Rory and Craig Hunterr enjoyed a great day out in Manchester. The entry sheet is on the Clubhouse noticeboard (so sign up there or contact Joanne Quirk on 07876-671417). Entry fee is £5.00 per pair . Entries are limited so please sign up as soon as possible  and get your team practising now! Court Rejuvenation - Now Completed! New! The court rejuvenation maintenance was completed on Tuesday 19th March, and all four courts are open again! Until the new sand has settled in, we can expect some quite low bounces - but this will get better as the courts are used more. The contractors will return in 2 to 3 weeks - when the courts have settled down - to top-up the courts. Many thanks to Garscube and Milngavie for allowing us some court-time during the past week. Let's play tennis! Events to keep you playing tennis this Spring New! tennis, and a thirst for coffee! The winter box leagues draws are on the clubhouse noticeboard. There are senior and junior competitions - singles and doubles. Matches to be played between now and April. Finals Day of the 71st Drumchapel Inter-club Tennis tournament was held on Saturday 28th October. This annual event is open to local clubs including Bearsden, Drumchapel, Glasgow University Staff, Milngavie, Nuffield Milngavie, Thorn Park and Westerton, and attracted 65 competitors. There were many closely fought matches with the outcome depending on a tie break! Bearsden were winners of the Senior Inter-club shield for the fourth successive year with Thorn Park as runners-up. And in the Junior shield, Bearsden took the trophy for the ninth successive year with Drumchapel runners-up! Tournament referee was Josie Beeley and tournament director and organiser was Eric Flack, Drumchapel. It was another hugely enjoyable and successful Prizegiving and Awards Dinner at Douglas Park Golf Club on Friday 5th October. This year included Mini Tennis awards for the first time, and the Committee would like to thank the members who supported the event and our live band this year Willow Moon. Alongside our Club Championships winners, there were also presentations for the Jan Shaw Trophies (Karen Gorman and John Perkins), the J. Black Trophy (Keith Wright and Joanne Quirk), the Barry Morris Trophy for Most Improved Player (Jason Allardyce), the Team of the Year (Ladies 1st Team), a Family Award (the Gordon Family), and the popular Special Awards. A surprise video presentation was shown to acknowledge young Kyle McKay winning 4 singles titles (including the Gents Singles) this year - with contributions from former BLTC Gents champions and several players from the GB Davis Cup team, including Dan Evans, Cameron Norrie and Dom Inglot! Special mention must go to Susan Burns, Fiona Dunlop, Fiona Berlouis, (Karen Gorman for her amazing cakes) and Joanne Quirk, for all their behind-the-scenes efforts - and, of course, to our master of ceremonies Phil Waterfield. The Raffle and Blind Auction were again a significant part of the evening's success and we would like to thank: The Bearsden Cross Traders, especially Cafe Creme; Christies Butchers; Lloyds Pharmacy; DS Interiors; Domino's Pizza; the Turkish Barber; Scott at KPs Fish; 3MC; Kulbir at the Post Office; Bearsden Chiropracters; Bearsden Osteopaths; Ian Hynds Travel; Stringsports; The Station; Co-op; Majestic Wine; The Tickled Trout; The Burnbrae; Bearsden Tyres & Autocare; Janice Anderson; Bearsden Driving Range - and especially our host venue Douglas Park Golf Club and their golf professional Robert Irvine. The 2018 Club Championships culminated in a cracking day of tennis on Saturday 8th September. The weather was mixed but there were some great matches enjoyed by the players and spectators, and a lovely afternoon tea provided by club members. The winners, runners-up and a brief report are on the Champions page. Huge thanks to all who participated, played, umpired, organised and baked! Membership Form 2018-19 - All subscriptions reduced by 60% New! From 1st October, all membership subscriptions are reduced by 60%! Benefit from reduced coaching and Tennis Camp membership fees. This year's membership form is available to download from the Membership page. There are also the Secretary's opening letters, the 200 Club application form, and you can view the Club Constitution and Byelaws. Our very own LTA Grade 4 Ranking Tournament was back for an amazing 29th year! This is a singles tournament for players of all levels of ability and all age groups - this includes minis, juniors and seniors - and is a great way to play new players and improve your ranking. Finals Day was on Sunday 5th August, and a full report is on the Tournaments page. Ladies 1st Team - Winners of Division 1/2 for 2018! Woohoo! The Ladies 1st Team have won this year's Division 1/2 title - with a magnificent 50 sets won across their 8 ties! Congratulations to all who played for the team this year - Emma Wright, Karen Christie, Ashley Donnelly, Susan Burns, Rachel Taylor, Suzanne Lord, Fiona Dunlop, Lesley Pratt, and last (but definitely not least) "Captain Quirk", Joanne Q. Well done! The annual Invitation Tournament was held on Sunday 3rd June, with eight mens and eight ladies teams from across the west of Scotland competing in this legendary doubles competition, organised by Josie Beeley. Winners of the ladies final were Western, with Milngavie winning the mens final. Bearsden teams were runners-up in both finals. All members are welcome to a new Friday Morning social tennis session from 10am to 12 noon, commencing Friday 4th May.Come along to enjoy some social tennis, a cup of tea, and a chat with your friends. On Sunday 29th April from 2pm until 4pm, the club hosted a Quorn Family Red Ball Cup event. It was a sunny day and the sixteen pairs of players that took part served up some exciting tennis action! Eventual winners were Rory Hunter partnered by his father Craig, who secured a very narrow victory (with a jammy net-cord!) over Rory Hastie and his father David, 10-9. New Clothing Range Available New! Head Coach Gordon Wilson is promoting a new BLTC clothing range which has match t-shirts, training t-shirts, lightweight waterproof jackets (ideal for playing in through the rainy Scottish climate! ), hoodies and long-sleeved training tops. You can also select from a choice of colours and each item is personalised with the Bearsden LTC logo and your initials. To help find the perfect fit, there are two clothing rails in the clubhouse with sample tops with all the various adult and child sizes. You can browse the Clothing Catalogue here, complete an Order Form and return it to Gordon. The match results all were close with most decided by match tie breaks. The winner Alasdair was presented with a new cup for this event, which has been very generously domated to the club by Josie Beeley. This year's Awards Evening was a great success at Douglas Park Golf Club. BLTC members enjoyed a lovely buffet dinner, award presentations, live music from MacBlondie, a blind raffle, a normal raffle, and lots of dancing! Boclair House Hotel, Hynds Travel, Glengoyne Distillery, Cycle Form, FollowFiona, the Burnbrae Inn, the Monadh Kitchen, Douglas Park golf pro Robert Irvine, Dining Inn (Mother India), Shearer Candles, Iron Chef, Edenmill Farm, Bearsden Tyre Services, Lloyds Pharmacy, and GWTennis. The 2017 Club Championships culminated in a great day of tennis on Saturday 9th September in glorious sunshine. The winners, runners-up and a brief report are on the Champions page. Thanks to all who participated, played, umpired, organised and baked! On Saturday 26th August, the Club hosted the annual mixed doubles tournament, with participants playing for the J Black BLTC Mixed Doubles trophy. As last year, this was a balloted handicap event followed by a barbecue, and it was a cracking day of tennis and off-court socialising. Jayne Gilkes and Scott Waterfield won the final against Fiona Jones and John Perkins. Our very own LTA Grade 4 Ranking Tournament was back for an amazing 28th year! And it was a great Finals Day in the sunshine, with some top class tennis to watch. Jack Walker from DL Hamilton retained the men's title, whilst Eilidh McLaughlin from Strathgryffe won the top Ladies trophy. There were great wins on the day too for Bearsden favourites Pauline Hughes and Bogdan Fodor! See the Tournaments page for a full report. On Saturday 17th June, BLTC held its Red and Orange Club Championships. In the Red Ball Under 8 competition, we had a entry of 8 players - and the winner was Rory Hunter, with Flynn Gilmour-Sweeney second, Sandy Robertson third, and Autumn Hunter fourth. In the Orange Ball Under 9 event, the winner was James Alexander, with Jacques Maisonneuve second, and Rory Hastie third. In the photo, their placings are in the order of how big their smiles are: James to the right, Jacques in the middle and Rory left! We hosted the 41st Annual Invitation Tournament on Sunday 4th June, when some exciting tennis was played by the nine local clubs competing for honours. Last year's winners of the mens event Bishopbriggs (Andrew Blair and Greg Marlo) successfully defended their title, beating our Bearsden pair (Andrew Christie and Liam Gordon) in a close final. And Bearsden (Susan Burns and Pauline Hughes) were runners-up in the ladies event too, with GU Staff (Genevieve Stapleton and Elaine Clark) taking the trophy. The Quorn Family Cup Red Ball is a national competition organised by the LTA to promote fun tennis for all throughout the UK. It's a doubles competition where a junior aged 10 or under is partnered by an adult from the same family, and the game is played on a mini tennis court with red balls and mini tennis rackets. The winners proceed to a regional final at one of the pre-Wimbledon professional grass court events in June. At the BLTC event, six teams took part in a round robin format. The event was great fun with much hilarity - but with keen competition too! Eventual winners were Ian Fodor partnered by his father, Bogdan, who secured a narrow victory in three sets over Rory Hastie and his father David, 10-7, 6-10, 10-7. They went on to represent BLTC at the regional final in Manchester on June 10th and, in a tough competition, came a very creditable third! In spite of the weather, the club held a very enjoyable tournament and Spring social event on Saturday 13th May. A full draw of 32 players were paired off into 16 mixed doubles teams, with some interesting pairings and match-ups! In the grand final, Joanne Quirk and Len Berlouis beat Carol Hamilton and Scott Waterfield 4-1, 1-4, 10-7, and in the consolation draw final, Jan Shaw and Adam Sidiki beat Davy Jones and Fiona Berlouis 4-1. Huge thanks to the social committee for organising the event, and for the fantastic food, drink and BBQ enjoyed by all. And on Saturday 20th May, a coffee morning/afternoon was held to raise money for Cancer Research UK. Home-baking, teas, coffees and sandwiches were served in the Clubhouse alongside the usual Saturday coaching and social tennis. What a fantastic feast it was - and £340 raised too! A BIG THANK YOU to everyone who baked and ate their way through Saturday's event. The star bakers, Karen, Maisie and Nikki produced Bake Off-standard cakes and these were much enjoyed by the Raffle prizes winners Fiona, Brenda and Karen. Club members and visiting parents were exceptionally supportive and generous with time and donations. Many congratulations to rising star Kyle McKay who was awarded the Tennis West of Scotland Junior Player of the Year Award 2016 at the TWoS AGM on November 28th. In the Under 12s league this year, Kyle won a staggering 20 sets out of 20, winning 120 games and only losing 13! He also made his debut for the Mens 3rd team and won his first set there too! Tremendous! This year's Awards Dinner at Bearsden Golf Club was a very enjoyable evening, with Club awards, prize-givings, dinner, a terrific raffle, some music, a hotly-contested tennis quiz, and plenty of refreshments. The team scores in the quiz were: Bears Ace - 19 (winners), President Select - 19, Ball breakers - 18, Double Faults  17, Monday Monday  15, Suzy Qs - 11, Double Faulty Towers Crew - 11, Shame weve got Colin - 10. Here is the Answer Sheet if you want to review your answers!. Finals day was on Saturday 29th October, and there were some great successes for BLTC - who retained the Junior Shield for the 7th year in a row, and the Senior Shield for the 2nd year. There were lots of BLTC players involved during the week too, with wins for Kafui Akpo-Young, Kyle McKay, Lucy Taylor, Karen Christie, Rachel Taylor, Phil Waterfield, and Scott Waterfield. Thanks to Eric Flack and Josie Beeley for running the tournament. 2016 Finalists: L to R: Lucy Taylor, Phil Waterfield, Rachel Taylor, Scott Waterfield, Karen Christie, Susan Burns, Esther Morgan, Eric Flack, Andrew Christie, David Buchanan-Smith, Niamh Slavin, Jevon Chan. Finals Day was on Saturday 10th September and the crowds were treated to some top-class tennis entertainment! 2016 Finalists: Seated L to R: Rachel Taylor, Karen Christie, Emma Wright, Kafui Akpo-Young, Jack Deveney, Luke Turnbull. Standing L to R: Kyle McKay, Scott Curran, Fraser Edwards, Phil Waterfield, Lucy Taylor, Scott Waterfield, Joanne Quirk, Adam Sidiki, Ashley Donnelly. On Saturday 27th August, the Club hosted a mixed doubles tournament to help raise funds for the club, with participants playing for the J Black BLTC Mixed Doubles trophy. The winners were Esther Morgan and Harry Leitch. There was a great turnout, the weather was lovely, and the BBQ and refreshments were enjoyed by everyone well into the evening! The club held a very enjoyable prizegiving/awards social evening on Friday 2nd October at Bearsden Golf Club from 7pm until 1am. There was a two-course hot buffet, live music from The Kay Family, bar, games, and an eclectic selection of awards! Many thanks to the fund raising sub-committee (Phil Waterfield, Pauline Hughes, Fiona Berlouis, Paul Mazoyer, Jason Allardyce and Josie Beeley) for their hard work. The 2015 Club Championships culminated in a great day of tennis on Saturday 12th September, despite the rain. The winners and runners-up are listed on the Champions page. Thanks to all who participated, played, spectated, umpired, organised and baked! In 2014, the Ladies 60+ team won Division 1 for the third year in a row, winning a ridiculous 93% of their sets! Congratulations to captain Jane Lowis, Alison Bland, Moira Burt, Dorothy Gordon, Mags Jefferies, June McCann, Jean Ogilvie, Kate Ross, Jan Shaw and Marlene Waudby. We're sure they'll be trying to make it four wins running next year! There were plenty of Bearsden LTC players taking part in 2014's Drumchapel Inter-Club event, and didn't they do well! Pauline Hughes won the Ladies Singles, then paired up with Esther Morgan to win the Ladies Doubles. There were wins also for Luke Turnbull in the Boys 12 and Under, and Lucy Taylor in the Girls 12 and Under. Phil Waterfield, Scott Waterfield, Iona Cadger and Rachel Gillespie were runners-up in the Men's Singles, Boys 16 and Under, Girls 16 and Under, and Girls 12 and Under events respectively. And the Drumchapel Inter-Club Junior Shield was won by Bearsden LTC for the fifth consecutive year! Well done to everyone involved. In June, our Mini Orange (9 and under) team won their division. A fantastic effort! Congratulations to Sam Crothall, Jack Deveney, Kyle McKay, Antony Sheridan and Sam Somerville (pictured below with their pennant and badges). For a review of this year's Doe Sport Summer Series tournament (the 25th! ), check out the Tournaments page. There is also a list of previous winners, and a section on the annual Invitation tournament. The 38th annual Invitation Tournament was held at the club on Sunday 8th June, and a great afternoon of tennis was enjoyed by all. In the top ladies' doubles competition, Emma Wright and Joanne Quirk (Bearsden) won 6-2 in the final against Clarkston's Jenny Hunter and Jennifer Hahn. In the men's event, the two Bearsden teams won through to reach the final, with Gordon Wilson and Ian MacAulay taking on the Bearsden 2nd team of Euan Proud and Scott MacAulay. Gordon and Ian just edged the final to win 6-4. As always, many thanks to Josie Beeley for organising and refereeing this very enjoyable event. The 66th Drumchapel Inter-Club tournament took place in late October 2013, and Bearsden retained both the Senior and Junior shields - the Seniors for the third time and the Juniors for the fourth! Bearsden winners were Gordon Wilson (Mens Singles), Rachel Taylor (Ladies Singles), Gordon Wilson and Joanne Quirk (Mixed Doubles), and Fraser Edwards (Boys 12&U). An extra mention must be made of Fraser for an amazing win in the semi-finals of the Boys 16&U event! This year's club championship finals were held on Saturday 14th September, and the results are on the clubhouse noticeboard. The winners and runners-up are listed on the Club Championship page. Well done to all involved! Congratulations to Gordon Wilson and Andrew Merry (Bearsden), who won the mens' event at the recent Invitation Tournament held at the club on Sunday 2nd June. On a glorious sunny day, the ladies' winners were Clarkston's Lesley Taylor and Mary Gow. As always, many thanks to Josie Beeley for organising and refereeing this very successful event. For further details, please click here for the Milngavie & Bearsden Herald report. Last year, our re-surfaced courts were officially opened by Jo Swinson MP on Saturday 20th April 2013. The sun shone and a full day comprising of coaching, cardio tennis, social tennis, and afternoon tea were enjoyed by all. Many thanks to Jo for finding time for us in her busy schedule.